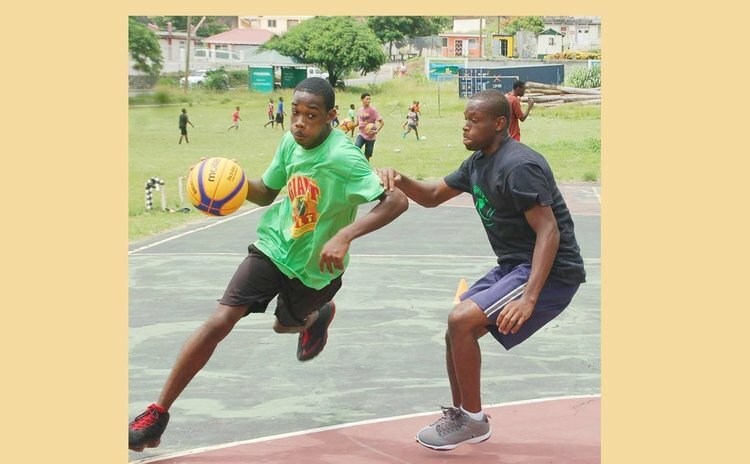 While playing basketball either competitively or recreationally, or even viewing a match from the stands, one may have uttered or heard certain expressions coming either from players or fans, referring to the game or something that may have happened during the encounter. Here are some Dominican basketball expressions describing players, match officials, shots at a basket, a pass, fun games, etc; these are presented in alphabetical order. Air Baaal: Said when a player shoots a ball that completely misses the rim, net and backboard. Begging: Describes a ball bouncing on the rim before dropping into the basket. Bèl-Maché (Pont Cassé): Said when a player commits a big travelling move which may, or may not, have been called by the referees. Belle-Marché Pont Cassé was a fund-raising walk organsied by the basketball association in 1969. Participants journeyed 28 miles, from St. Mary's Academy (SMA) in Roseau to Hillsborough Bridge at Layou, to the Pont Cassé Round-about, down the Imperial Road to Canefield and ending at SMA. DOMLEC Power Failure: A Free-Throw attempt that falls far short of the basket and backboard, i.e. it lacks power. DOMLEC is Dominica's power company. D-o-n-k-e-y: A shooting game involving two or more players. When the first player makes a shot, the second player shoots from the same spot, and if he misses he gets a D. The player's second miss would earn him an O, and this continues until he has missed a total of 6 shots - the number of letters in the word DONKEY. Energizer: Describes a player who seems not to tire out in a game, even while he is very actively marking/defending his opponent(s), dribbling, etc. ERIC'S BAKERY or Working for ERIC'S: Said about a team or player who is causing a large number of turn-overs in a match. While in operation, ERIC'S Bakery produced very tasty Turn-Overs. Harpoon Shot: Big hook-shot from one of the corners of the court to the nearest basket. Kochon-Basketball or Kochon-Court: A player, who wants to "do-it-all" in a game, does not pass the ball, dribbles excessively, shoots excessively, and also has a low field-goal percentage. One-Arm Bandit: A player who is unable to dribble with both hands but is fairly efficient using his trained hand. Pan Cake or Biscuit: A very flat jump-shot with very little arc. Parachuters' Club: Said when a defensive player is faked, he jumps, and returns to the ground even while his opponent with the ball has not yet moved from his position. Rainbow Coalition: A shot with a very high arc, like a rainbow. Rough 21: A half-court fun game involving several players competing against each other, each aiming to reach 21 points. Roun' De World: A shooting game involving two or more players, where a total of 29 shots must be scored from thirteen fixed spots around 'the key' and back to the starting point, which is under the basket. The game includes players starting and ending with two consecutive hook-shots (one right-arm, one left-arm); having to score one shot from the top of the 'key', followed by two consecutive free-throws; one shot from each of the top corners of the key, in addition to shots from both sides of the key, first on the way up and again on the return 'journey'. Sockin' De Whistle: Said about a referee who blows his whistle very tentatively on an infraction, or just doesn't blow. (Literally means that the ref' is sucking the whistle). Sòl: Slightly derogatory term used by some losing players and their fans to refer to a referee whose calls appear to favour one team over the other, i.e. he seems to be 'seeing on only one side' - like a sole fish, which is called "sòl" in our Kwéyòl language. Solar Power: Term used to describe a player who 'shines' while playing pick-up games during the day-time but is unable to perform at a similar level 'under the night lights'. Three-Three or Two-Two: Half-court games involving teams of three or two players respectively. Officially these are known as "3-on-3" or "Two-on-Two" respectively. Touch-Down Pass: A long inbound pass, or a long pass from under or near a team's own basket to a team-mate close to the opponent's basket. The recipient would then take a simple 1-2 lay-up shot… and scores. Voyé-Mouté: A sort of unorthodox, 'wild', but successful shot made by a player who, in a tough defensive situation, seemingly just 'throws the ball up' at the basket... and scores! Do you know other local basketball expressions that were not captured above? N.B. The above was first presented in a Report on the 2014 National Basketball Season to the DABA.